Davies Evans & Law Ltd are estate planning specialists, who protect clients' assets from 3rd parties, by the use of appropriate packages of Wills, Trusts and other legal instruments. 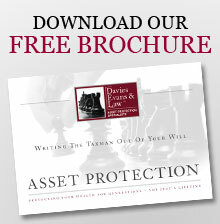 So what is it that we are protecting clients' assets from? As you know, each client is different. Some will be concerned about losing their family home and other assets to Long Term Care costs. 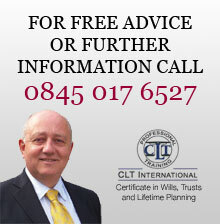 Others may wish to ensure that an inheritance passed to their children does not then get lost to a future divorce, nor to a further slice of IHT – on the same money - when it eventually passes to the grandchildren. There are many other examples why clients have called upon our services, and I would be happy to discuss these with you. Remember, if you can't offer this service to your clients someone else will, and may take all of their business. Please feel free to contact me today, so that we can discuss my proposition, and I can show you how you and your clients could begin to benefit, in the way other professional advisers and their clients are already benefitting. •	Now in spouse's ownership – remarriage/death/divorce! AND avoids future Periodic Charges, by correct construction. A trust holding assets is passed on to the next generation. Will they know how to get the best use of it, or will they just wind it up?